Like every year since 1882, the first Monday of September, dated 7th of this year, will be celebrated as Labor Day all across the nation. It is a day meant to celebrate the contributions of the citizens to the economy of the United States of America. To appreciate the work of pet owners, vets and us, PetCareSupplies has organized a Labor Week sale. Yes! A discount of 7% on all pet supplies will be given for this whole week. This is our token of saying thanks to all those who care for pets. PetCareSupplies has a huge fan base, but we never want to stop. For those who don’t know what PCS is, here is our short description! This company has been in the market for more than a year now, and in this short span of time, has received a great response from the customers. PetCareSupplies focuses on selling branded treatments for dogs and cats at lower prices than available at physical stores. For this reason and free shipping service, this company is being preferred more than any other by the pet owners. We offer the top brands of flea & tick control, wormers, wound repair and joint care for both, canines and felines. It is absolutely easy to navigate through the site for anybody. The workers at PCS continuously try to stay connected with the pet owners and the LABOR WEEK sale is one of them. It is also our purpose that you gain something in every offer, and you may do in this sale too! Let’s see how! Firstly, if you order from PetCareSupplies, even without the discount you may gain the opportunity to buy best brands at the rate of generic ones. As this week is a discount week, you have a chance to gain more! The very same brands will be available with a discount of 7%. Unlike other pet care stores, PetCareSupplies will not charge you for shipping the order. Your order, irrespective of the size (May it even cost $1) will be delivered for free. You won’t lose money on this, which ultimately is a gain! We have the most popular flea and tick brands to choose from, which may not be available at such low costs! Visit our site and gain the benefit of buying products like Advantage for dogs at super saving prices! So, isn’t the Labor Week Sale worth a visit? Stop by and shop the top notch brands for your pet’s health at discounted rates. 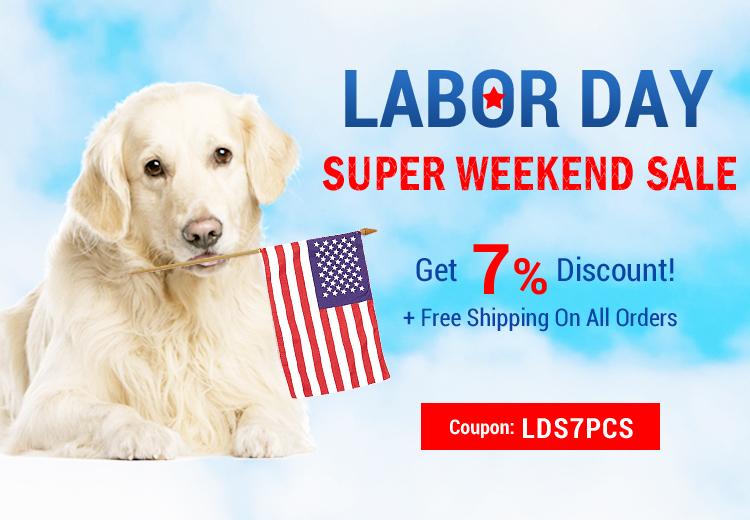 To apply the labor week discount, use coupon code: LDS7PCS. « Gagging The Bow-Wows & Meows May Harm Pets- Say NO To Devocalization!